Because I am a Girl 2010: Girls and ICTs | Wait... What? The urban and digital environments are the 21st century’s fastest-growing spheres. Both offer enormous potential for girls around the world, but prejudice and poverty exclude millions of girls from taking advantages of the transformative possibilities that cities and information and communication technologies (ICTs) can offer. Exploitation and the threat of violence exist in both urban spaces and in cyberspace, especially for the most marginalized and vulnerable girls. Since 2007, Plan has published annual reports on the state of the world’s girls. 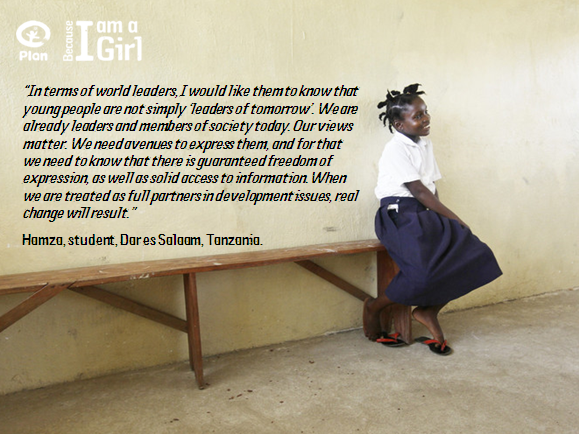 The 2010 ‘Because I am a Girl report’ is called Digital and Urban Frontiers: Girls in a Changing Landscape. It focuses on girls in these two rapidly expanding spaces: the urban and the digital. The piece that I’m most interested is the segment on Girls and ICTs, since that’s the main area I currently work on. (Disclosure: I contributed to the development of the chapter). To give you a taste of what’s in the report, here’s a summary of Chapter 4: Adolescent girls and communications technologies – opportunity or exploitation. You can download the full report here. Chapter 4’s introduction explains that online behaviors mimic offline behaviors. Empowerment and abuse of girls reveals itself through technology as it does in other areas of girls’ lives. Through girls own voices, expert opinion and original research, the report highlights the positive and negative consequences of ICTs, in particular mobile phones and the Internet. The authors talk about the positive ideas and new ways of thinking that ICTs open up for girls in terms of learning, networking, campaigning and personal development. They then discuss the darker side of technology — how cyberspace makes it easier for sexual predators to operate with impunity, where girls are prime targets for abuse, and where girls are sometimes perpetrators themselves. Section Two offers girl-related statistics on the digital revolution and the digital divide and highlights the enormous variation between and within countries in terms of digital access, and the gaps between rich and poor, male and female, urban and rural. The report cautions that excluding girls from the digital revolution will have consequences on their growth and development. For additional global ICT statistics (1998-2009) see this post at ICT4D blog. Another resource on mobiles and women is the Cherie Blair study. Section Four goes in depth around ways that adolescent girls compete with adolescent boys for the most use of communications technologies such as mobiles and the Internet, but that often they are using them for different reasons and different purposes. Most of the available research for this chapter is from the ‘North’, yet the studies indicate that girls tend to use ICTs for communication and boys tend toward a focus on the technology itself. Studies on this from the ‘South’ are unavailable to date. Section Five discusses the barriers that keep adolescent girls from accessing ICTs. In other words, if the importance of ICTs has been established, girls are willing and able and keen to use ICTs, then what prevents them from having equal access to ICTs? Some of the issues that the chapter discusses are those of power and control. ‘I can immediately call the wholesale market to inquire about prices and place direct orders. I am now recognized as a businesswoman, growing and selling sesame seeds, not just as somebody’s wife or sister,’ said a woman in India. ‘You’re a girl – a mobile can cause many problems, and so you don’t need it,’ said the father of a Palestinian girl. Girls’ access to technology is limited by their societies, communities and families. In patriarchal societies where men control technology, girls and women simply have less access, because ICT’s confer power on the user. Even in educational settings, a study found that boys tend to hog available ICTs. Teachers have distinct expectations from boys vs. girls. Girls also don’t tend to go into the field of ICTs or want to have ICT careers, since the field is typically a male field. ‘Technology appears to be marketed by men for men. It’s time we started switching bright and talented girls on to science and technology,’ comments a British government official. Women and girls in developing countries however are not receiving the basic education and training that they need to be ready technology adopters. They are seen as users and receivers of technology, not as innovators involved in technology design and development. Once they are computer literate, however, many young women see the computer industry as a route to independence. The report offers statistics on the numbers of young women in countries like South Africa, India, Malaysia and Brazil who are working in the ICT related industries and professions. What stops girls from using technology? Discrimination – girls are still viewed as second-class citizens in many societies. Numbers – boys both outnumber girls and tend to dominate access to computers. Confidence – because they don’t have equal access at school, girls may be less confident than boys when it comes to going into IT jobs because they don’t feel they have the same skills and knowledge as the young men competing for the jobs. Language – in order to use these technologies, English is usually a requirement, and for girls with only basic literacy in their own language, this is a major barrier. Time – girls’ domestic roles, even at a young age, mean they have less free time than boys to explore and experiment with new technologies. Money – girls are less likely than their brothers to have the financial resources to pay for, say, a mobile phone and its running costs, or access to the web in an internet café. Freedom – boys are also more likely to be allowed to use internet cafés because parents are concerned about their daughters going out on their own. Section Six digs into the dark side of cyberspace and the risks that adolescent are exposed to at a time of their lives when they are beginning to develop sexually. One in 5 women report having been sexually abused before the age of 15, according to the authors. The Internet by and large is simply a new medium for old kinds of bad behavior, however; and new technologies simply extend the possibility of abuse to new arenas. Girls who are not even using the Internet are still vulnerable, given that a photo of them can be taken and posted by someone else even if they have no computer access. Cyberbullying and cyberharrassment are other risks that girls face. Many young people and youth organizations are active in facing these risks and protecting themselves, and various campaigns exist to help adolescent girls be more aware of how to protect themselves while using ICTs. New technology can itself also be a tool to help with counter-trafficking efforts. The chapter outlines some of the different efforts being made to protect girls online, and emphasizes the role of parents and schools in discussing on-line use and being supportive as girls begin exploring cyberspace. Brazilian girls in a digital world. As an annex to Chapter 4 on ICTs, new research with 49 boys and 44 girls, aged 10-14 examines adolescent girls’ rights and protection in Brazil within the context of ICTs. ICT use is growing exponentially in Brazil, particularly among 15-17 year olds, where between 2005 and 2008, ICT usage went from 33.7 to 62.9 percent. The study covers use pattern, links between on-line and off-line behavior, and on-line safety. Conclusions. The report concludes by calling for greater knowledge about ICT-related sexual exploitation and violence against girls, more emphasis on prevention and stronger international standards. It also points out that girls need to be empowered to use new communications technologies safely, on their own terms, and in ways that promote their development and build their futures. Call to action for September 22: As part of the launch of the Because I am a Girl Report, Plan is calling for International Day of the Girl to be established on September 22. You can sign the petition here. Download the Girl’s Cohort Study: Real Choices, Real Lives. Plan researchers follow 142 girls lives over a 9-year period.